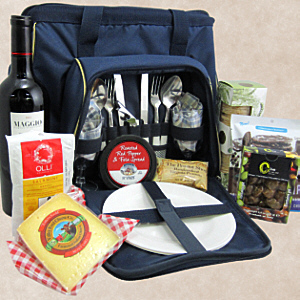 Artisan food carried in an attractive and very practical tote, makes this a perfect picnic basket. The tote comes equipped with plates, glasses, silverware, napkins and a corkscrew. Inside the insulted main compartment we tucked in a California Cabernet, Estero Gold Cheese, Olli Salamini (small bite sized salamis, no nitrates, no hormones, delicious), Italian Olives, Willaimsburg Virginia Peanuts, Roasted Red Pepper and Feta Spread, and Crunchy Chocolate Cookies for dessert. With all this good food and a tote to use for years to come, this becomes a perfect present.